Do Paid App Downloads Have a Future? App Annie recently released an interesting report detailing the top 9 trends of 2013. Among these, the chart above caught my eye for a couple of reasons. 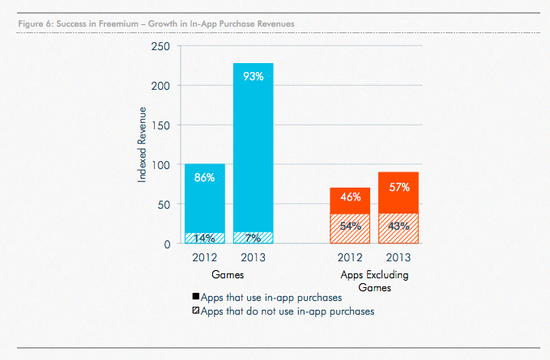 First, it shows that practically all app revenue growth in 2013 was driven by in-app purchases. Second, non-gaming apps generate a substantially larger proportion of their revenue from paid downloads (assuming this does not include in-app advertising revenue). 1. At least some of the revenue from paid downloads is generated by "full" or "pro" versions of trial apps (e.g. : Titanium Backup Pro, Nova Launcher Prime, etc. on Google Play). This model bears more economic similarities to a freemium model than it does to traditional paid downloads as it taps into artificial scarcities created by the "lite" version. 2. While the freemium business model is becoming more prevalent in categories such as messaging, music, news and dating, it may be difficult to induce scarcities in categories like utilities. Some utilitarian apps (certain productivity applications, for example) may still command a premium because their substitutes are not nearly good enough. Here, the nature of competition for their use cases is not near-perfect (yet). However, as free or freemium substitutes improve and competition becomes more "efficient", the paid model may become more difficult to sustain.